Property Location You&apos;ll be centrally located in Orlando with a stay at The Eo Inn And Spa, minutes from Lake Eola Park and Cathedral Church of St. Luke. 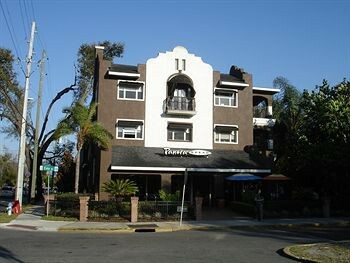 This spa hotel is within close proximity of St. James Cathedral and Orange County Regional History Center.Rooms Make yourself at home in one of the 17 air-conditioned rooms featuring DVD players. Your room comes with a pillowtop bed. Complimentary wireless Internet access keeps you connected, and cable programming is available for your entertainment. Private bathrooms with showers feature complimentary toiletries and hair dryers.Rec, Spa, Premium Amenities Relax at the full-service spa, where you can enjoy massages, body treatments, and facials. If you&apos;re looking for recreational opportunities, you&apos;ll find a spa tub and a steam room. This hotel also features complimentary wireless Internet access and concierge services.Dining Satisfy your appetite at the hotel&apos;s restaurant, which serves breakfast, lunch, and dinner. Dining is also available at a coffee shop/café, and room service (during limited hours) is provided.Business, Other Amenities Featured amenities include limo/town car service, express check-in, and express check-out. Free self parking is available onsite.